University of Wisconsin – River Falls tops the collegiate contest. It started as a fairly subdued evening for the University of Wisconsin-River Falls (UWRF) contestants. They had not won a team category until the final breed, the Red & Whites. And then, the winning streak began. They outpaced the competition in the Red & Whites by 13 points — a lot in terms of breed totals. Then, they won oral reasons. 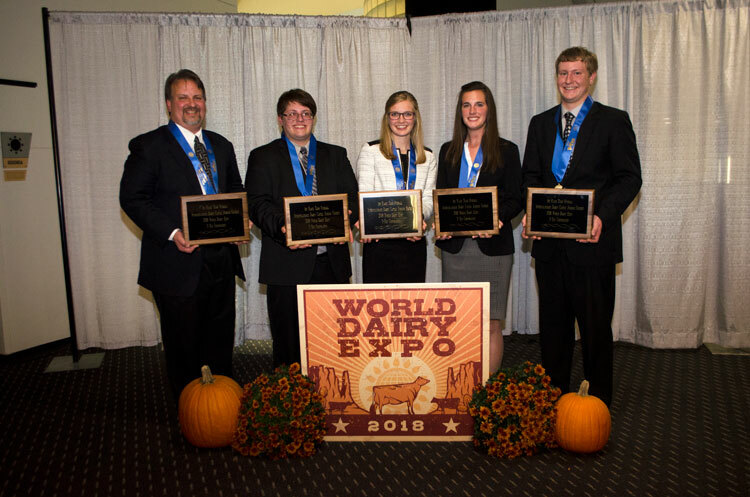 And they wrapped it up with High Team honors at the 2018 Intercollegiate Dairy Judging Contest. UWRF team members were Erica Helmer (third individual and second in reasons), Kaila (Wussow) Tauchen (ninth individual), Matt Kramer (18th overall and High Red & White individual), and Clint Irrthum. UWRF professor Steve Kelm and UWRF alumni and dairy farmer, Mary Holle, coached them. They scored 2487 total points, just three points ahead of second-place Virginia Tech. It was only UWRF’s second national title in the 98-year history of the contest. 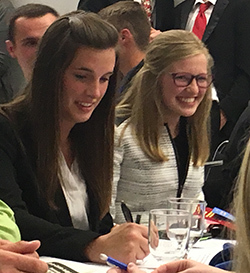 Kaila Tauchen and Erica Helmer just before UWRF was announced as the winning team. Coach Kelm remarked that one of his favorite memories of the night was the expression on Kaila Tauchen’s face when she was announced as the ninth place individual. Her name was not called during any of the preliminary breed honors, falling just out of the top 10 spots every time. After she was called as the ninth place individual, the UWRF team members thought they had a chance to win. Virginia Tech’s team was led by Shelby Iager, the High Individual. She hails from Bulldog Holsteins in Maryland. With a deep pedigree in dairy judging, she continued the family tradition. An uncle and grandfather each won the National 4-H contest, and her dad, Michael, also placed high nationally. She won the Guernsey, Holstein, and Ayrshire breeds, placed third in reasons, and had the highest placings only score. She was a front-runner from the first breed announcements. Her teammates were Katelyn Allen (11th individual), Sarah Thomas (23rd individual), and Leah Hall. Professor Katharine Knowlton and Kayla Umbel coached them. They won the placings portion of the contest as well as the Jersey breed. University of Wisconsin-Madison placed fourth and was led by David Pintens, the second overall individual who also won the Jersey and Milking Shorthorn breeds. 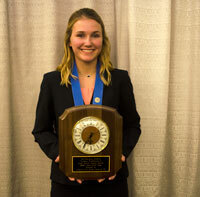 Placing fifth was Oklahoma State University with California native, Nicole Sanders, pacing the team with a seventh individual award and fifth in oral reasons. The Brown Swiss breed was won by Abigail Hopp of South Dakota State University. Her team also won Brown Swiss team honors. The individual hardware was spread wide. Eight schools were represented in the top 10 individuals. In addition to those mentioned above, University of Minnesota’s Kayla Leiding was fourth individual and fourth in reasons, The Ohio State’s Kate Sherman was fifth individual, and Michigan State’s Makayla Petter was eighth individual. A special entry in the collegiate contest was a team from Holland, Ares University of Applied Science. They are a sister university to UW-River Falls. They finished 12th in a pool of 19 full teams, with two members finishing in the top 35 contestants. While Dutch is their native tongue, they delivered oral reasons in English. Reasons are a difficult task for anyone, but it’s doubly challenging in someone’s second language.